The company is set for double-digit earnings growth and trades at an attractive valuation. Full-year 2016 figures show that the company generates almost 84% of its operating income from its climate segment. The rest comes from a diverse set of products, including oil and gas compressors, power tools, and golf carts, all lumped together in the industrial segment. In recent years, the climate segment has outperformed expectations, particularly with regard to operating-margin expansion. The industrial segment has under-performed largely because of weak oil and gas conditions and a sluggish U.S. industrial economy, but it's expected to recover. The company just managed to hit the bottom end of the three-year 2014-2016 guidance set in November 2013. But even then, the actual 2013-2016 EPS growth rate was still pretty impressive, and the 2017-2020 outlook calls for 11% to 13% earnings growth. Data source: Ingersoll-Rand PLC presentations. CAGR = compound annual growth rate. The HVAC market will be attractive for the next few years thanks to positive trends in commercial and residential construction, as well as the replacement cycle from the housing boom of a decade ago. The leading players are all reporting positive indicators in 2017. United Technologies' climate, controls, and security segment, for example, grew equipment orders 7% in its first quarter, and management continues to predict that its commercial and residential HVAC sales will grow by mid-single digits and low single digits, respectively, in 2017. HVAC is a good growth market. Image source: Getty Images. Over at HVAC-focused Lennox International, management declared the company "off to a strong start" in the first quarter and set for a "record year," with full-year 2017 revenue growth expected to be in the 3% to 7% range. Ingersoll-Rand, meanwhile, continues to generate strong bookings growth in its climate segment. The industrial segment is seeing a nice bounce in booking as well, in line with a general recovery in industrial and oil-and-gas capital spending in the United States. Data source: Ingersoll-Rand PLC. Chart by author. Ingersoll-Rand stock is up nearly 36% in the past year, but it's still attractive on a risk/reward basis. 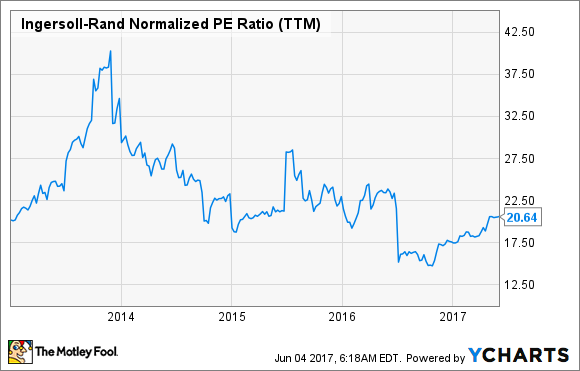 Based on a combination of analyst consensus estimates for 2017 and 2018 and the midpoint of management's guidance for EPS growth, here's how the company's earnings and P/E ratio could look in the coming years. These forward valuations represent substantial discounts to the valuations the stock has traded at in recent years. Throw in management's expectation for free cash flow conversion from net income to exceed 100% in the coming years, and the stock is attractive on a cash flow basis, too. Ingersoll-Rand offers a free cash flow to enterprise value (market cap plus net debt) yield of nearly 5% and low-teens earnings growth in the years to come. Moreover, current trends in its climate segment remain strong, and management continues generating margin expansion with the company's Trane HVAC solutions. All told, it's the most attractive stock in the electrical equipment sector.